From pristine beaches and breathtaking natural wonders to award-winning cuisine and exciting nightlife, the Sunshine Coast is perfect year-round to explore, plant roots, and settle down. But year-round sun isn’t always a good thing. High energy bills and a lack of privacy cause Australian homeowners to waste thousands of dollars trying to beat the heat. Now, there’s a better solution, and it can save you money every month and make your home more stylish, comfortable, and valuable: plantation shutters. Do you spend too much on cooling your home in summer? Does the sun ruin your blinds or shutters in just a few short seasons? Does the constant sunlight make it hard to have any privacy in your home during the day? If so, Timber Shades Sunshine Coast has the solution for you. If you have high bills…. Energy costs keep rising, and Sunshine Coast homes require a lot more cooling than the average Aussie home. All of the sunshine beats directly on your home year-round, and most shutters trap the sun’s ultraviolet rays in the home and increase the heat exponentially. Plantation shutters are specially designed to reflect the sun’s rays, keeping your home cool to the point you won’t even need your air conditioner. It’s like you two were made for each other! Don’t get us wrong, we love sunshine as much as the next Aussie, but with all that sun coming in, it can be hard to get any privacy. It’s especially difficult if you live in a popular beach tourism town. With shutters that encompass your entire window, you’ll be able to completely lock out prying eyes and the rays of the sun so you get maximum comfort and privacy. The best part is that you can control the light completely—you can choose as much or as little as you want. When your shutters are made from durable timber, they don’t let any light through unless you want them to. All that sun will wear down your blinds, curtains, and shutters over time, and when the sun is intense, it might only take a few seasons (or only one!). Durable plantation shutters made of high-quality wood will last years if properly maintained. Also, they are extremely easy to clean. The wood (or faux wood if you choose), can be cleaned in just one wipe of a cloth. 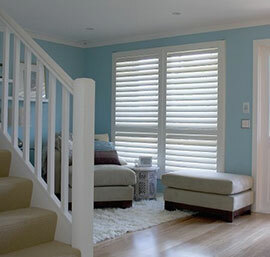 Plantation shutters fit any style in any home but go great in the wide open spaces of the Sunshine Coast. If you’re looking for a way to lower your energy bills, save time, and finally get some privacy, contact Timber Shades for a free design consultation today!